Wanting more family time?Has quality family time taken a back seat in your busy lives? Our special family classes are one of the few activities that adults and children can participate together in reaching their goals. 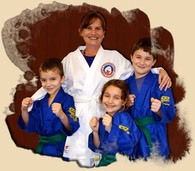 Parents will get all the benefits they would expect from an adult class while your children improve their focus, concentration, discipline, confidence and more. Enjoy quality time with your family, get in shape, achieve together and create memories that will last a lifetime! Begin today with our 30-Day Trial Beginner Program for families.